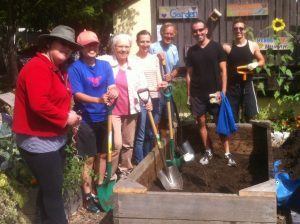 I joined the Kitsilano Community Centre Collaborative Gardeners in 2015, the first summer I lived in Vancouver and the first full year of operation for the garden. One of the gardeners took the photo on the left at one of our work bees last year. This photo became the cover shot for the summer program guide for the Centre in 2017. I can finally add “cover girl” to my résumé. Phew! Time was running out. The opportunity to garden at the Centre has been wonderful for me. Getting my hands dirty with others has helped to ground me in my new community. I can hear you groaning. Sorry. Couldn’t resist. For one reason, working collaboratively in the garden provides an opportunity to grow as an individual. The gardening group is flexible and forgiving. What better place to use my strengths and shore up areas where I want to evolve? For another, the challenges we have just now excite me. Organizations have life cycles and predictable points of crisis. The initial phase is marked by euphoria and excitement, as the founders pitch in and fulfill all sorts of roles to get the organization established when only a few are involved. Then things change. A leader gets tired. A founder moves away or goes on an extended vacation. Some members start to ask for clarity about roles and policies. That’s where I see our gardening group. A few key folks will be away this summer. This is the time to welcome additional people, improve our communication tools and processes, and set up systems that help everyone who wants to be involved find ways to contribute that fit with their interests and capabilities. My goal is to foster leadership among all the members and to step back gradually as we establish systems that will keep us sustainable. I think this goal is highly achievable. No doubt the garden will provide interesting developments that inspire additional blog entries over the summer. Watch for them! This entry was posted in Writing on April 27, 2017 by Wilda.